As we sit down to plan our retirement, we ask ourselves some tough questions: Am I saving enough? Am I ready for the lifestyle change? Do I need to tighten my budget now or will I need to in retirement? These questions are all aimed at helping us answer one central question: When is the right time to retire? According to recent Gallup research, there is often a significant gap between the age we plan to retire and how old we are when we actually do. 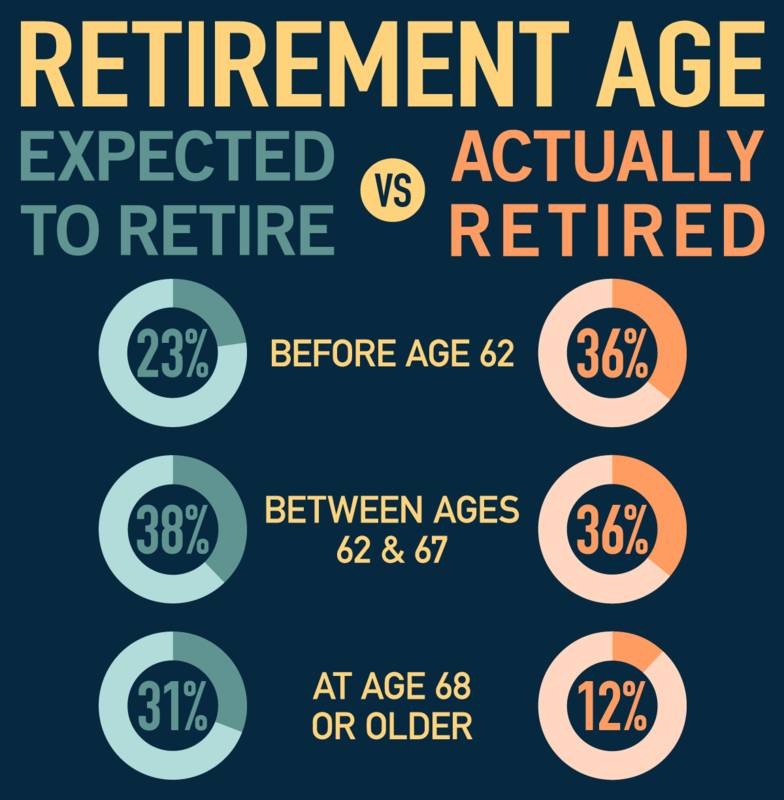 On average, there is a significant gap between the percent of workers who plan to retire within a certain age range and the percent of retirees who actually did. For example, 31 percent of workers intend to retire at age 68 or older. However, only 12 percent of retirees actually do. And, only 23 percent of workers think they’ll retire before age 62. Nevertheless, 36 percent of retirees ended up doing so. On average, Americans expect to retire at age 66, but actually retire at age 61. That means a significant number of us may be underestimating how many years our retirement savings need to last. Regular readers may recall that most NYSLRS retirement plans have a minimum age requirement to retire with a full benefit. However, once you are vested, you are generally able to retire as early as age 55. An early retirement may come with a significant — and permanent — benefit reduction, though. So, if you plan to retire with a full benefit at age 62 (or 63 for Tier 6 members), but end up retiring early instead, your pension will be less than you planned. 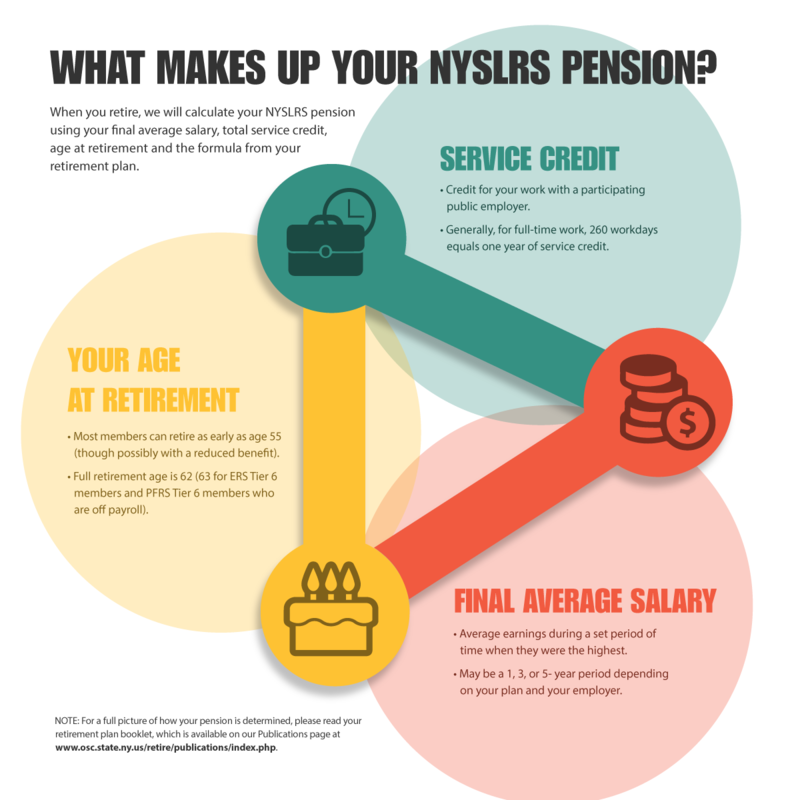 NYSLRS has several resources to help you make your retirement plans and stay on target. We distribute your Member Annual Statement (MAS) between May and July. It contains valuable information to help you understand your benefits and plan for the future, including: your earnings, your service credit total and up to three pension projections based on your specific details. You can also check out our Preparing for Retirement — A Checklist and 5 Step Plan for Retirement pages on our website. Our Life Changes: How Do I Prepare to Retire? publication offers a step–by–step guide to the retirement process, a list of available resources and some key factors to consider as you plan. If you have any questions about your retirement plan, we’re glad to help. Email us using our secure email form, which allows us to safely contact you about your personal account information. Content last revised April 18, 2018. This entry was posted in General News and tagged Early Retirement, MAS, Member Annual Statement, New York State & Local Retirement System, NYSLRS, NYSLRS pension, NYSLRS Retirees, pension, Preparing to Retire, retirement, retirement age, retirement planning, vesting, when to retire on April 18, 2018 by NYSLRS. 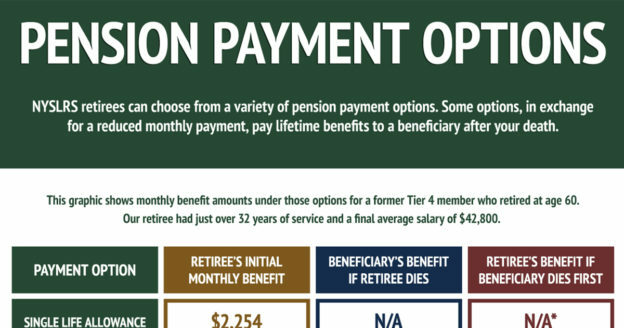 Generally, three main components determine your NYSLRS pension: your retirement plan, your final average salary (FAS) and your total service credit. NYSLRS retirement plans are established by law. Your plan lays out the formula we’ll use to calculate your pension as well as eligibility requirements. It’s important to read your plan booklet, which you can find on our Publications page. If you aren’t certain what retirement plan you’re in, check your Member Annual Statement or ask your employer. Your FAS is the average of your earnings during the set period of time when they were the highest. For ERS and PFRS members in Tiers 1 through 5, that period is three consecutive years; for Tier 6 members, it’s five consecutive years. Some PFRS members may be eligible for a one-year period, if their employer offers it. We will use your FAS, age at retirement, total service credit and the formula from your retirement plan to calculate your NYSLRS pension. Generally, the earnings we can use for your FAS include regular salary, overtime and recurring longevity payments earned within the period. Some payments you receive won’t count toward your FAS, even when you receive them in the FAS period. The specifics vary by tier, and are listed in your retirement plan booklet. In most cases, the law also limits how much your pensionable earnings can increase from year to year in the FAS period. Earnings above this cap will not count toward your pension. Our Your Retirement Benefits publications, (ERS and PFRS), provide the limits for each tier and examples of how we’ll determine your FAS. Service credit is credit for time spent working for a participating public employer. For most members who work full-time, 260 workdays equals one year of service credit. Members who work part-time or in educational settings can refer to their retirement plan publication for their service credit calculation. 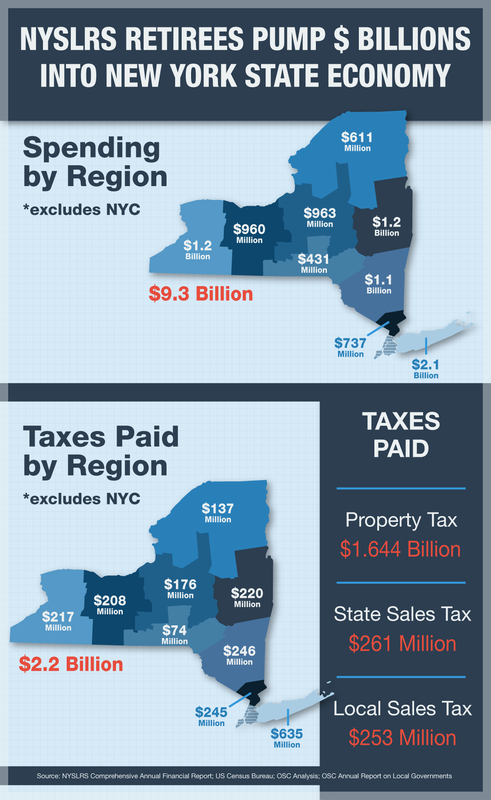 Service credit is a factor in the calculation of your NYSLRS pension. Generally, the more credit you have, the higher your pension will be. Some special plans (usually for police officers, firefighters or correction officers) let you retire at any age once you’ve earned 20 or 25 years of service credit. In other plans, if you retire without enough service credit and don’t meet the age requirements of your retirement plan, your pension will be reduced. As you get closer to retirement age, keep an eye on your service credit and FAS. Make sure we have an accurate record of your public employment history. You can sign in to Retirement Online or check your latest Member Annual Statement to see the total amount of service credit you’ve earned. You may also want to take a look at our budgeting worksheet or try our Benefit Projector Calculator as you plan for your retirement. 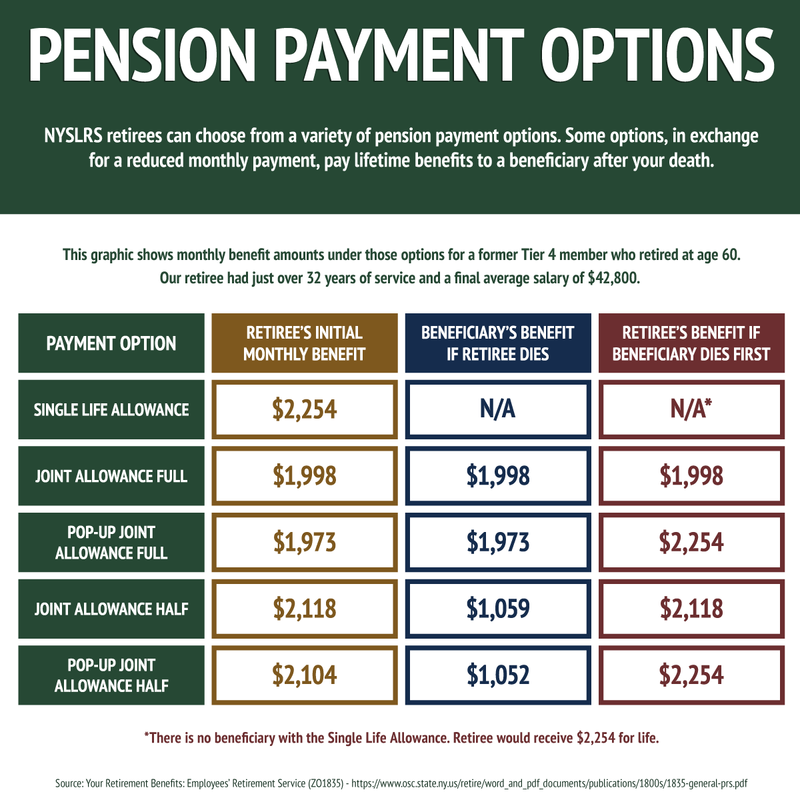 If you have questions, or want to find out more information about what makes up your NYSLRS pension, please contact us. Content last revised April 4, 2018. This entry was posted in General News and tagged benefits, ERS, FAS, Final average salary, know your benefits, Member Annual Statement, members, New York State & Local Retirement System, NYSLRS, NYSLRS pension, pension payment option, PFRS, retirement, Retirement Online, retirement plan, retirement planning, Service credit on April 4, 2018 by NYSLRS.